KAMPALA – Bugweri County MP Abdu Katuntu has on Tuesday insisted he will carry on his work as chairman of the Committee on Commissions, Statutory Authorities (COSASE) because parliamentary authorities have yet to change the leadership. “As chairperson of this committee and deputy chairperson, we are not dying to be in these positions. No body is stuck in an office against rules of procedure of parliament. We will leave as soon as they do [allow]. Rule 157(8), parties through the Chief Whip shall designate members for a Committee to be announced by the speaker and accordingly assume their respective membership. There is no member who has been designated and his name announced in parliament for him to assume leadership of the office. The press should clarify this”. After controversy surrounding the fate of the inquiry into Bank of Uganda affairs in view of the change of leadership of the Committee, Speaker Rebbeca Kadaga last week extended Mr Katuntu and his deputy Bukedea MP Anita Among’s term, to finish the report and lashed at the Leader of the Opposition for politicizing the matter. “My request is not to say we shall not have changes but the changes will come after they have reported, I have only request for a slight extension,”Ms Kadaga said in reference to the opposition’s demand that Mr. Katuntu hands over the leadership of the Committee to Kawempe MP Mubarak Munyagwa even when he is yet to complete the investigation into the controversial sale of Crane Bank and six others. Mr. Katuntu’s tenure is set to expire on January 13 but Ms Kadaga insisted that he will first complete the writing of the report on Bank of Uganda. Opposition’s Forum for Democratic Change has since appointed Munyagwa to replace Katuntu as COSASE chairperson while Rubaga North’s Moses Kasibante is the new vice chairperson in waiting, to replace Bukedea Woman MP Anita Among. On Tuesday, Mr Katuntu also dismissed talk by incoming vice chairperson Kasibante that his Committee had asked for an extension from the Speaker. Katuntu: You have been following the debate about the tenure but more particularly the leaders of the committee. I think the debate has been raging for so long because it had bonafide and non-bonafide arguments about the tenure and business of this committee. As chairperson of this committee and deputy chairperson, we are not dying to be in these positions. Nobody is stuck in an office against rules of procedure of parliament. We will leave as soon as they do [allow]. Rule 157(8), parties through the Chief Whip shall designate members for a Committee to be announced by the speaker and accordingly assume their respective membership. There is no member who has been designated and his name announced in parliament for him to assume leadership of the office. The press should clarify this. There is a person who is chairperson and Hon. Kasibante in Vice-chairperson. Once those members are designated, they will assume leadership. So what is this hullabaloo about? Let everybody get contented that once his name has been designated he will be in this chair and vice will be in their chair. We don’t have a debate in good faith. I don’t intend to get into politicking. Florence Namayanja: We are here legally. Katuntu: After the two and half years and in our view it ends on the 13th of this month. Amos Kasibante: Some opinion within parliament is that a term cannot be extended. You went and asked for the extension and the matter is about the legality of that extension. Whether it is within rules for the committee to be extended. 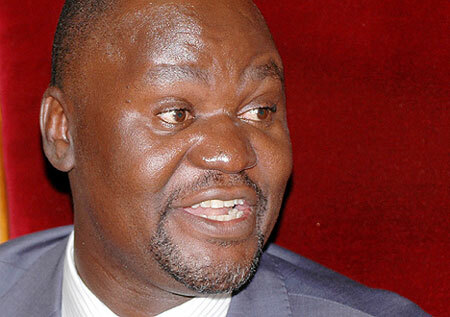 Katuntu: That will be handled by person who says it will be the extended. That decision isn’t mine. Abraham Byandala: If you remember what the speaker said, we had a serious talk. People can talk, you can’t stop them. I genuinely ask we stop discussing, let us do the work which brought us here. Beatrice Anywar: I think what you had communicated, we can have another moment. It would be better than we do business of today. We shouldn’t waste a lot of time what is going on on social media and we wait until the head institution pronounces herself. Kasibante: This isn’t a social media issue. We should give confidence to the public. Katuntu: It is also not true that we went to speaker to seek for extension. Like indeed all serious chairperson of committees we always brief speaker on the work we are doing. We briefed her on how far we have gone. I did explain that it isn’t possible the speaker suggested she will engage the leadership of opposition to get way forward. That negotiation I am not party to it. What we did is to brief the speaker in case the speaker should be abrased with all facts going on in the committee.